We guide you through choosing the right control hardware for your machine and customize software to meet your performance goals . Partnering with Kraft Fluid Systems for your electronic control requirements, you will have access to a support team that handles everything from software development & systems integration to inventory fulfillment. 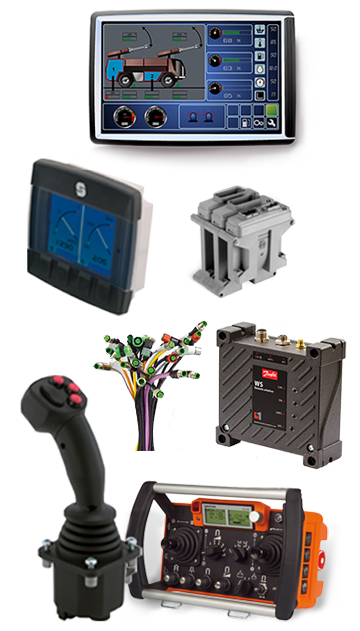 Learn more about our electronics offering by browsing the selections below or call us at (800) 257-1155 to speak to one of electronic control specialists and learn about our capabilities. Browse the manufacturer pages below for forums and technical specifications on the controllers, joysticks, displays and radio remote controls we offer. At Kraft Fluid Systems, one of our Electronic Control Specialists can help you develop custom software for your application. Years of application and programming experience has advanced us as a leader in mobile machinery systems integration. Speed up time to market by working with Kraft Fluid Systems. Kraft Fluid Systems Announces New Partnership With Dana Inc.